Thank you to Simon Williams and Peter Dowsett, Head of History at Nottingham High School for Boys, whose kind assistance and contribution helped to bring this information to you. Thank you to the boys of Nottingham High School for continuing to honour the sacrifices made by Robert Thrale and his generation. By 1916, however, they seem to have moved to 13, Harley Street, Lenton, Nottingham. Robert Thrale was a a bright boy and was awarded the Dame Agnes Mellers' scholarship. His scholarship was one of ten Agnes' Mellers' scholarships given in any one year and was worth five pounds per annum, full tuition fees, though the family had to pay one pound twelve shillings per annum for books. Basically, his school fees were paid for three years. It is difficult to be completely certain nowadays, but Thrale may well have been scribbling graffiti on the walls of the boys' toilets. In such a sensitive era as Edwardian England, nobody in a school ever used the word "toilet". Instead, we know from elsewhere that they were always referred to as the "offices". By September 1908, Thrale was in second form A with Mr. W.T. Ryles as his form master. He came 17th out of 28 boys in the class, and for mathematics, was 10th in Set IIa. By September 1909 he was in third form A with Mr. W.E. Ryles as his form master. This Mr. Ryles was the brother of his form master from the previous year. Robert came 16th out of 19 boys in his class, and for Mathematics, was now 21st in Set 3a. In Science, he was 22nd in his class. During the course of this year, he was awarded a Bowman-Hart prize for his singing. The following year, he was in classical fourth form A, with Mr. Lloyd Morgan as his form master. He came 26th out of 29 boys in this class, and for mathematics, was now 22nd in Set IVa. In chemistry, he was 25th in his class, and in physics, he was 22nd. He left the High School in July 1910, which may have been a financial decision, at it is known that his scholarship lasted only for three years, and by this date, those three years were up. 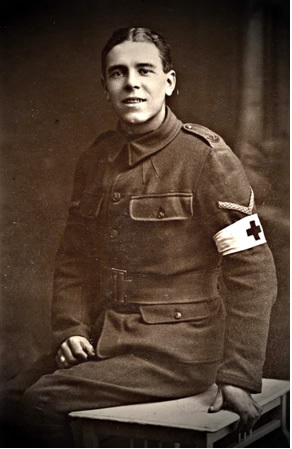 The only information known, is that Robert was Captain of the Battalion football team. If anyone can help to fill in the gaps - or has time to do some research in the archives, your help would be welcome. Corporal 2025 1st / 7th Bn., Sherwood Foresters who died on Saturday 1st July 1916. Age 20. Additional Information: Son of Robert and Elizabeth Thrale, of 13, Harley St., Lenton, Nottingham. Cemetery: Thiepval Memorial, Somme, France. Panel Number: Pier and Face 10 C 10 D and 11 A. Location: The Thiepval Memorial will be found on the D73, off the main Bapaume to Albert Road (D929). Each year a major ceremony is held at the memorial on 1 July. Historical Information: On 1 July 1916, supported by a French attack to the south, thirteen divisions of Commonwealth forces launched an offensive on a line from north of Gommecourt to Maricourt. Despite a preliminary bombardment lasting seven days, the German defences were barely touched and the attack met unexpectedly fierce resistance. Losses were catastrophic and with only minimal advances on the southern flank, the initial attack was a failure. In the following weeks, huge resources of manpower and equipment were deployed in an attempt to exploit the modest successes of the first day. However, the German Army resisted tenaciously and repeated attacks and counter attacks meant a major battle for every village, copse and farmhouse gained. At the end of September, Thiepval was finally captured. The village had been an original objective of 1 July. Attacks north and east continued throughout October and into November in increasingly difficult weather conditions. The Battle of the Somme finally ended on 18 November with the onset of winter. In the spring of 1917, the German forces fell back to their newly prepared defences, the Hindenburg Line, and there were no further significant engagements in the Somme sector until the Germans mounted their major offensive in March 1918. The Thiepval Memorial, the Memorial to the Missing of the Somme, bears the names of more than 72,000 officers and men of the United Kingdom and South African forces who died in the Somme sector before 20 March 1918 and have no known grave. Over 90% of those commemorated died between July and November 1916. The memorial also serves as an Anglo-French Battle Memorial in recognition of the joint nature of the 1916 offensive and a small cemetery containing equal numbers of Commonwealth and French graves lies at the foot of the memorial. The memorial, designed by Sir Edwin Lutyens, was built between 1928 and 1932 and unveiled by the Prince of Wales, in the presence of the President of France, on 31 July 1932. The dead of other Commonwealth countries who died on the Somme and have no known graves are commemorated on national memorials elsewhere. He is also commemorated on the Roll of Honour that is hung in the foyer of the school. A photo given to the school of Robert Thrale is kept in the school archives. Peter Dowsett, an history teacher at the school, is researching information about the 204 old boys of Nottingham High School killed in the Great War. That number includes 2 holders of the Victoria Cross and many contemporaries of Robert Thrale. 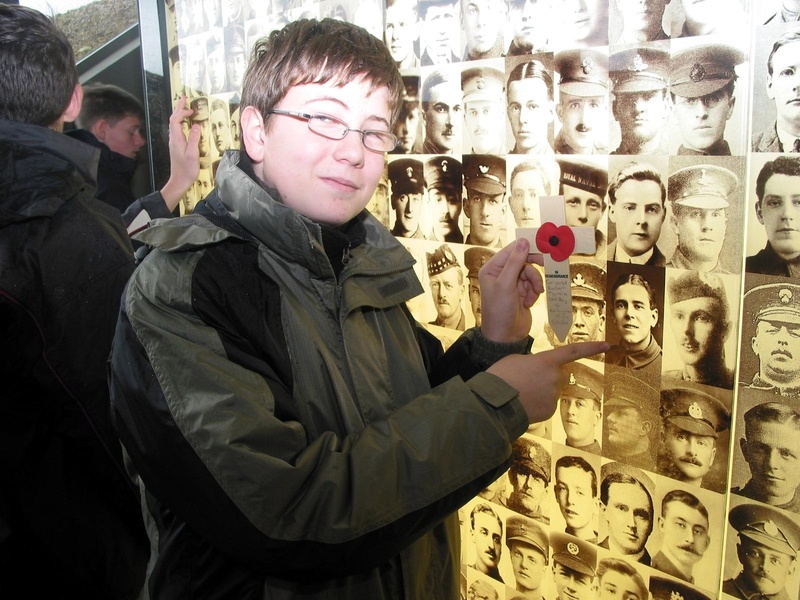 In 2004, a group of boys from Nottingham High School for Boys travelled to the Western Front Battlefields visit taking 41 students and 5 staff. They marked the commemorative engraving of Robert Thrale on the Thipeval Memorial with a small poppy cross. Student James Banks was given the task of searching for his name and leaving the cross as a mark of respect. There are 17 Old Boys of Nottingham High School commemorated at Thiepval. On Friday 15th October, at the unearthly hour of 5.30am, the entire staff of the History Department and forty-one boys gathered outside school, and waited for the tardy coach. Our transport, though slightly overdue, did eventually arrive, and after a brief passport-related delay, we set off for France. A “Welcome Break” was had by all at Toddington Services, and we promptly met our guide, Mike, at Calais a little after 11.30am. We enjoyed a smooth ferry trip, but I observed while on deck the rather bleak clouds gathering around the northern coast of France. Once in France, it began to drizzle, and the weather continued spasmodically to do so throughout the trip. Our first stop was the Canadian National Vimy Memorial, which overlooks the Douai Plain from the highest point of Vimy Ridge, about eight kilometres northeast of Arras. The Memorial consists of two jutting limestone pinnacles, into which in some places are carved statues, the most famous of which is the Weeping Woman. This saddened figure represents Canada - a young nation mourning her fallen sons. The surrounding landscape is pocked and pitted by shell holes, which create a landscape best likened to Teletubby Land, as the shelling here was extremely intense, and the front lines just metres apart. I left the ridge shocked and repulsed by the sheer volume of life that had been lost at just one nation; a feeling that was to be repeated constantly at every monument or cemetery we were to visit. We then drove to our accommodation, the welcoming Château D’Ebblinghem, a 19th Century Château turned hostel located 8kms east of St Omer in the Pas de Calais region of Northern France. After a filling dinner and an evening of relaxation, we settled into our beds, and enjoyed a needed night of rest. We spent the next day touring the Somme Battlefield. Among other sites, we visited the Lochnagar Crater and the Thiepval Memorial. The crater is the product of the “sapping” that went on during the battle of July 1916, part of the attempt to destroy the Germans before the allies “went over the top”. While most of the operations failed to achieve this end, any German in the vicinity of this explosion stood no chance on 1st July 1916. Then, the crater measured 300ft across and 90ft deep; though much reduced now, the crater still packs a pretty impressive punch to the visitor. Our next stop was the Thiepval Memorial. Designed by Sir Edwin Lutyens, the names of 72,000 British soldiers are carved into the stone of this massive memorial. Without wishing to appear irreverent, it looked to me rather like an overdressed Christmas cake; indeed, the French planning authorities only agreed to it on the condition that it would be screened by trees. After locating my assigned Old Nottinghamian, Robert Thrale, I placed a small cross in his memory. Thrale attended the school on a Dame Agnes Mellers scholarship between 1907 and 1910, and to read about a particular Old Boy re-humanises the terrible loss suffered, as one often becomes detached from the reality that there are people behind the names on the School Memorial and Roll of Honour. We set off for Belgium early the next morning, bound for Ypres. Having been virtually obliterated by the end of the War, its medieval shops and streets have been skilfully reconstructed so that the city might appear as it had done before the War. When you compare it to our equivalent, perhaps Coventry, the continental version comes out most favourably. The In Flanders Fields Museum was spectacular - the combination of audiovisual effects, informative exhibits and computerised information points conveyed both factual knowledge and a sense of what it was like to live Ypres during the War. Every five minutes, a huge simulated explosion rocked the building; an hour of shelling was quite enough for me, and I cannot comprehend the horror of incessant bombing for years. We then spent some time at the famous Menin Gate, another Memorial to the lost, which was designed by Sir Reginald Blomfield in the style of a Roman triumphal arch. Upon it are inscribed the names of a further 54,900 of the 'missing'. Everyday, at 8pm, the local police stop traffic from passing underneath the gate, and the Last Post is played by buglers from the Ypres fire station. After purchasing the obligatory Belgian chocolate, we piled onto the coach (some of our number feeling slightly ill) and headed off to Tyne Cot cemetery. Other than its being the largest British war cemetery in the world, Tyne Cot is an archetypal British war cemetery. “Row on row” of white graves stretch away in every direction, inscribed by default with “A Soldier of The Great War” and invariably adorned with the cross. 11,908 graves are registered within Tyne Cot, and on the wall at the back of the cemetery are the names of a further 34,927 men with no grave. A stark comparison can be drawn between the relatively light, bright atmosphere of this cemetery and the close, dark feeling of the Langemark German cemetery we next visited. Here, the soldiers are often buried in mass graves, and the black stone is darkened by the lack of light that permeates the tree cover. It is a sad, depressing place, and incidentally a favourite day out of Hitler when he was in France during the Second World War. We were shocked to discover that our bus driver’s grandfather was commemorated at Langemark, and this served as a painful reminder of the hurt felt by the families of our past enemies, as well as that of our own. Our last stop was the small Bridge House Cemetery where we laid a wreath in remembrance of one Old Nottinghamian in particular, but also in honour of all Old Boys who died in the Great War. 2nd Lieutenant John George Roe attended the school between 1907 and 1910, and died during the Passchendale offensive of 1917. A few words were said by our guide, and a moment’s silence held. This was a fitting end to the trip which had, to some extent, brought home the human cost of the First World War. Just so you don't get a surprise, I am writing a book about the relationship between the first world war flyer, Albert Ball and his fiancé. It is a novel but also a biography of Ball that considers the role of women in WW1. Ball was part of a scout troop that met in Willoughby St, Lenton. Last week I met with Steve Zaliek, the editor of the Lenton Times. He has researched every name on the Lenton War Memorial and Corporal Thrale appears there. As the family lived on Willoughby St for a while I chose Thrale to be a member of the scout group. He appears in two parts of the book. In the first he visits the home of Ball as a child. The second is an imaginary account of his death at Gommecourt. I have treated him as a character in a novel, but based what I have written on a contemporary account Steve gave me. I know he was Captain of the Battalion football team, so I made him a Nottingham Forest fan. The book is not finished and I do not have a publisher, but everyone that has read it has been extremely positive. It will be finished before Christmas and then will do the rounds of Literary Agents. I just wanted to warn you the Thrale name might soon be in print.